Renee is a picky eater and this is one thing that she will eat. It makes my day when she eats and i don't care if it takes the whole day to make it. It is worth the while. The best recipes are recipes that come with the manual of the kitchen appliances and this one is from automatic breadmaker. Choose the program for pretzels in the breadmachine and turn on 'start' and wait for program to end. 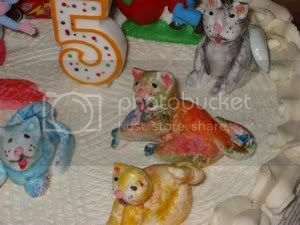 To do it manually or with cake mixer, knead all the ingredients until soft and elastic. Cover and leave to rise until double. 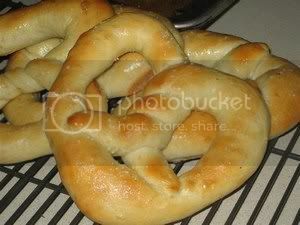 On a lightly floured surface, cut dough into pieces - 8 or 16 pieces. Cross the ends of the rope to make a loop(i pick up the left end with my right hand and right end with the left hand). Twist the crossed ends once and fold across the loop. Place on a greased baking sheet 1 1/2 inches apart. Brush with glaze and sprinkle with topping. Let rise until double in size, about 30 minutes. Bake at preheated 375 f/190 c for 15 - 20 minutes or until done. Optional: i like to drizzle with melted butter as soon as it is out of the oven. Add 1 cup sliced pepperoni and 2 tablespoons Parmesan cheese to dough ingredients. Follow above method to complete. Again another one of those that have failed attempts after attempts. I just don't know why i bother to make this as i personally do not like to eat it. Is it because that i can't make it smile when everyone is making smiling fatt koh and that keeps in search of????????. 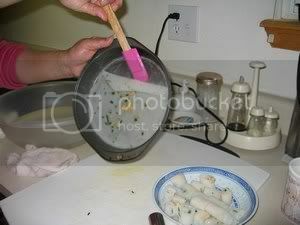 I think i have found the correct steamer that is making the fatt koh smile and it is the spaghetti pot. Chop up the sugar into small pieces and add 100 ml water. 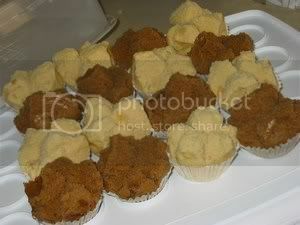 Cook in the microwave or stovetop until sugar melts. Sieve and let it cool. 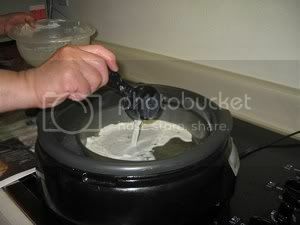 Add all the ingredients in the cake mixer and using the whisk, whisk until thick and smooth. Heat the spaghetti pot with 2 inches of water and bring to high boil with the cups on the steamer to heat them before pouring in the batter which should be 90% full. Cover lid tightly and steam for 15 minutes. 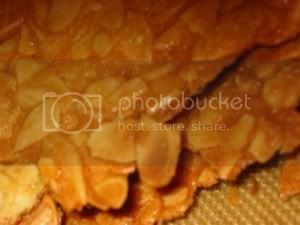 The kuih should smile if the right amount of batter, time for steaming and maintaining high heat are observed. 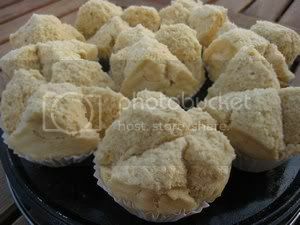 The ones made with gula melaka are very fragrant while the ones with peen thong are very plain but not floury though. This dish is named after the black vinegar which is distilled in Chin Kiang , Jiangsu Province in China and the meaning of the name is "Garrison (of the Yangzi) River" These ribs are traditionally braised for 45 minutes but using the pressure cooker, it only takes 10 minutes. Heat oil and brown the pork ribs. Leave aside. 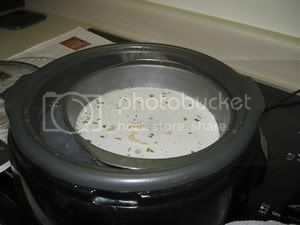 Place the pork ribs and rest of the ingredients and gravy into the pressure cooker. Cover and bring pressure to high. Lower the heat to the lowest but maintain the high pressure. Cook for 10 minutes. Release pressure immediately and remove cover. Cook gravy until it thickens slightly, then further thicken with cornflour solution. 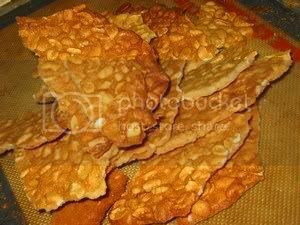 These crisps are addictive and i have to thank Lee Ping for sharing this recipe. 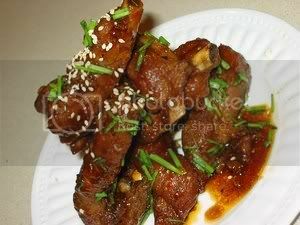 She has step by step pictures and it is here http://hipfood.wordpress.com/. I made the original using almond flakes and then another batch with cashews, therefore, i have named them Nutty Crisps. This is one of those recipes which is easy and have the least of ingredients and i think it is healthy too as only egg whites are used. This is one way to use up the egg whites accumulated from making cookies which required egg yolks only. Spread the nuts on to the baking sheet. Put to bake for 16 minutes and the crisps should brown at the sides. Turn off oven and leave the crisps to brown. Check the oven every 5 minutes, crisps should be totally brown and crisp in 10 - 15 minutes. Remove crisps from oven and leave to cool. Once it has been cooled, it can be broken up at random and enjoy. Cook the rice stick according to the instructions on the back of packet. Rince in cold water and drain dry. Top a plate of cold hu tieu with garlic oil, sweet sauce, fried shallots and roasted sesame seeds. 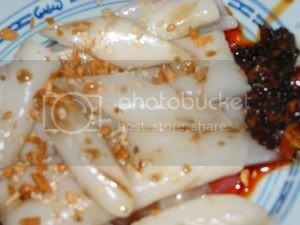 Chee Cheong Fun is one of my most favorite breakfast and it has been a mighty frustrated task for me as i could not get the right texture that i like. I liked the type that is sold for breakfast in Petaling Jaya and it is not the commercial rolled ones that is selling with fish balls etc. 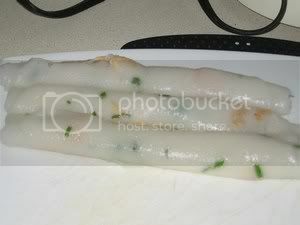 This is flat and has a speckle of dried shrimps and green onions. 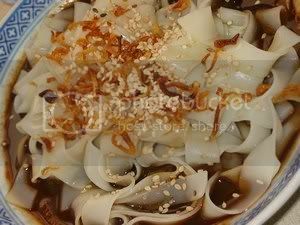 The sauce is diluted 'teem cheong' which used to be dark red but now has been replaced by a brown sweet sauce. I have been looking for the recipe for more than half of my lifetime. Recipes after recipes, my poor daugther has to eat the yurky results. Some recipes do turn out alright but the method of making them is not worth it. My conclusion is that it is not the recipe, I have been barking up the wrong tree, it is the method and of course an undesirable ingredient - Borax. It can be omitted, but it makes the sheets glozzier, more elastic, and less sticky and this is the texture that I like. The desirable method is to have the pan floating on top of boiling water and so a skillet with a tight fitting lid that can accommodate the pan and still allow room for steam to circulate is required. Spray pan with vegetable oil. I use 2 eight inch pans. Swirl and tilt pan around to level batter, cover and steam until cooked. Spray 2 eight inch pan with vegetable oil. Pour water 3/4 inch deep into a skillet. Make a cold water bath by filling a second large pan with 1 inch of cold water. 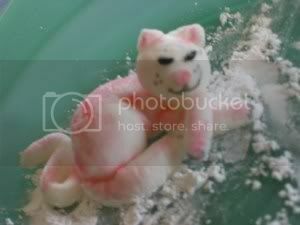 In a medium bowl, combine the rice flour, tapioca flour, salt, borax powder and oil. Add 3/4 cup cold water and stir until smooth. Stir in the hot boiling water and chopped spring onions. Bring the water in the skillet to a boil, then reduce the heat so it is barely bubbling. Float the oiled pan on the water to heat it through. 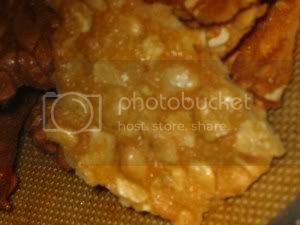 Give the batter a quick stir and ladle 1/4 cup of the batter into the pan and a sprinkle of chopped dried shrimps, tilting the pan to spread the batter evenly. Cover and steam for 3 - 4 minutes, or until the sheet has cooked through. 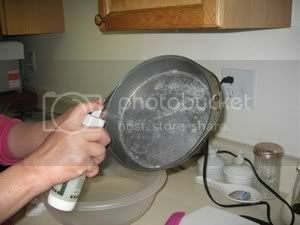 Transfer the pan to the cold water bath for 2 minutes. Use a flat spatula to loosen the sheet along one edge, then roll it up loosely. Transfer the roll to a plate. Repeat with the remaining batter, cleaning and oiling the pan each time, and replenishing the simmering water in the skillet as necessary. To serve, cut the roll into 1 inch slices and top with sauces of your choice. 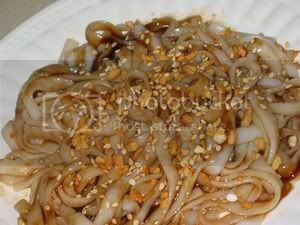 In a big microwavable bowl, combine the grounded teem cheong, peanut butter, garlic & onion powder, soya sauce and dark soya sauce. Mix them well by adding a little water at a time. Finally add in all the water. Cook on high in the microwave for 2 minutes. Stir and add in 1/4 cup sugar, Stir well and continue to cook for another 2 minutes until all the sugar has dissolved. Adjust taste by adding more sugar and if the teem cheong is not so salty, a dash of salt should be added to bring out the sweetness. Cook further for 1 minute and sauce is ready. 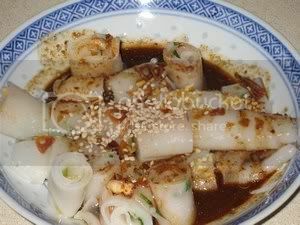 It will taste better if you serve the sauce while it is warm as the chee cheong fun has to be at room temperature. 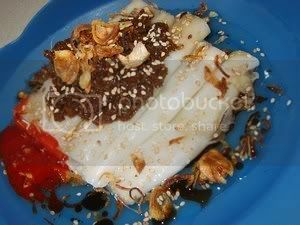 This chee cheong fun has to be eaten as soon as it is made. 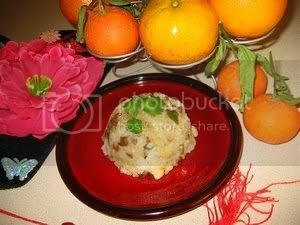 This is the celebrated eight-treasure rice eaten at Chinese New Year. In the early days of the Han dynasty (202 BC-AD 220), rice was considered a delicacy as millet was the staple grain. Eight-treasure rice depicts the almost spiritual significance of rice to the Chinese people, bringing good fortune and blessings to all at the beginning of a New Year. So, i cooked this dish for my friends who came to my New Year's Eve Potluck, hoping and wishing that they will have good fortune and blessings for the new year. Combine the rice and wash 3 times. Heat the peanut oil in a wok until almost smoking. Stir-fry dried shrimp until fragrant, remove and set aside. Fry the Chinese sausages until fragrant, remove and set aside. Fry the diced chicken until brown and then add the mushrooms, onion, and bamboo shoots for 1-2 minutes. Add the soy sauce, five spice powder, sesame oil, and salt. Stir-fry to mix well, lastly add in the lotus seeds. Cook the rice in the rice cooker with 10 cups of water and when it is done, add the stir-fried ingredients, mixing them through the rice. Cover and leave on warm for 10 minutes. Turn off the heat, and allow to stand for 10 minutes. Stir the rice with chopsticks, adding the chopped scallions. 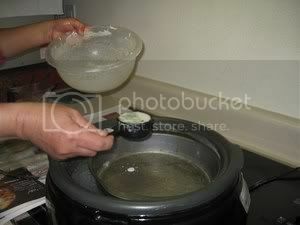 Remove the rice from the pot and pack into a lightly oiled bowl, pressing in firmly. 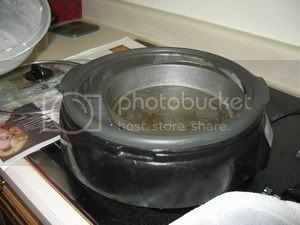 Steam the rice in the bowl for 10 minutes, and invert to serve. Renee turned five on 23rd March, 2007 but this little girl has tall orders. 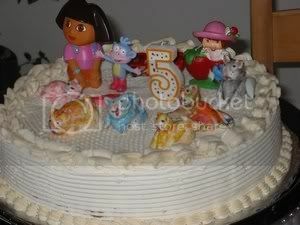 She wants all her favorites on top of her birthday cake. She wanted Dora, Boots, Strawberry Shortcake, Lightning McQueen and all her Kittens. So, i told her that i will try. 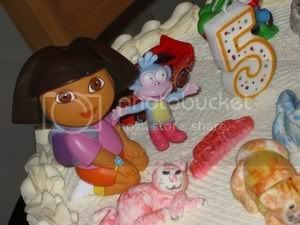 Tried to make Dora with sugarpaste but it was not as easy as i thought it would. So, decided to go store hunting for all her requested figurines. 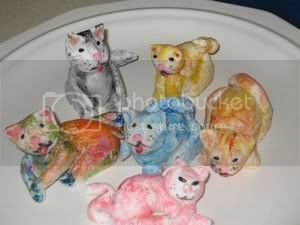 Found most of them except the Kittens so i had to continue making them with sugarpaste and ended with 6 - approved by Renee. The Birthday Cake is the same strawberry cake iced with the never fail buttercream. 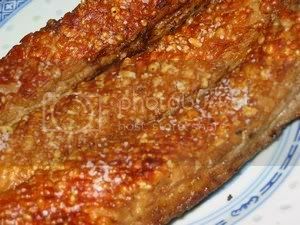 Although i am satisfied with the crackling in Roast Pork II, I had to try out a different way besides poking the skin. 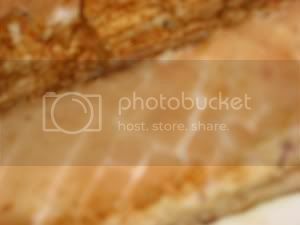 I had marinated 5 pieces of belly pork and it had been in the fridge to dry out since last night. i started the grill and scored the skin of one piece with a very sharp knife, like how you would score the diamond cut on the squid(see the first picture). I put the scored piece and the plain one for grilling. After 15 minutes of grilling with both top and bottom fire, i found that the scored piece had already started to crackled, while the plain one was just soft enough for poking. So, i started poking the softened skin with the craving fork and then returned it to the grill. This time with the top grill only for another 15 minutes. The scored piece was already crackling from the edges and looking good while the poked piece had no reaction at all. Turned on the grill for another 15 minutes and then only the poked piece was starting to crackle slightly while the scored piece is almost done crackling all over the skin. I sprinkled salt on to the skin 5 minutes before the time is up. The poked piece had to go another 2 rounds of 15 minutes before it totally crackled. To prove that scoring was the way to go, i scored the other 3 pieces and grilled the same way as the above and they were perfect(second picture). So, the conclusion to perfect crackling is SCORING THE SKIN and have the belly pork in 2 inches strips rather than one whole big piece. Score the skin after blanching in vinegar bath and sprinkle with salt(the salt might pull out some moisture) ( I found that it was hard to score after drying in the fridge , that's why i am recommending to score before drying). Leave uncovered in the fridge to dry out for at least 12 - 24 hours. Cool before cutting in bite size for serving.